Travel: /ˈtræv.əl/ to move or go from one place to another, to proceed or advance in any way. When we talk about travelling, interestingly, it is often the act of travel itself, of moving from A to B, which is absent from the conversation. We talk of hostels, of tours, of sights, of food and culture – but how we move between one place and another is frequently forgotten. But unlike the routine travel we do back home – the daily commute, the weekend trips to visit family, the night buses back from the pub – “travelling” can provide some truly memorable means of reaching a destination, and as the Chinese proverb says, the journey becomes the reward. Here’s a round up of my five most memorable travel experiences – some because they were terrifying, others because they were unexpected. And many were both. 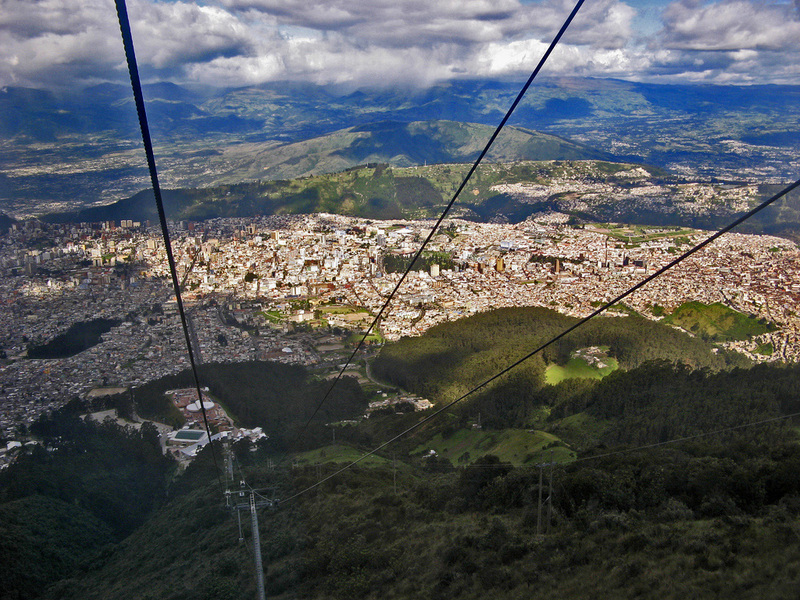 View over the city of Quito, Ecuador, from the TeleferiQo cable car. Ecuador’s capital is overlooked by the looming Pichincha Volcano. Part of its steep slope can be traversed by cable car – the TelefériQo – which takes you from 2,900m to over 4,000m altitude in the space of less than ten minutes, meaning that when you step out of your little pod at the top, you suddenly can’t walk properly. But my biggest problem was finding how to get the bus from downtown Quito to the base of the TelefériQo. I asked a couple of bored-looking policemen where the bus stop was. They didn’t know either, but… the younger one could give me a lift… on his motorbike. So that’s how I ended up in a flimsy summer dress and flip-flops on the back of a police motorbike trying not to burn my ankle on the exhaust as we wove in and out of the downtown traffic. That’s also how I ended up, helmet-less, screaming “slow down!” and gripping onto the policeman as we ascended the base of the volcano at top speed. And I made it up the TelefériQo in the end – but the journey to the top wasn’t quite as memorable as my journey to the bottom. When asked if I wanted to “go for a walk with the llamas” on the little dairy farm I was staying at in Tigua, in the Ecuadorean Andes, I thought I would go for a scenic stroll, accompanied by the llamas. I had no idea I would be riding one. Although Pepe, as he was called, was the least scary of my unpleasant transport experiences, he was also by far the least comfortable. The wool blankets thrown over his back barely cushioned his spine, and with no stirrups my feet dangled inches from the ground. It could have been worse though: my guide confided that he used to ride the llamas with his friends as a child. The stubborn creatures appeared to have a cruel sense of humour – they would race off and stop dead in front of a stream, dropping their heads so that the children flew forward, landing headfirst in the water. My first time hiking through the jungle was a truly immersive experience. Several hours of torrential rain had left both me and the contents of my backpack utterly drenched. My rain poncho had been abandoned, useless, and my wellies were full of water. Worse, the deluge had swollen the Cayapo River which stood between us and our destination, the village of Playa de Oro. Waist-high and thundering, there was no way I could cross it. While I slumped in the mud, exhausted, covered in mosquito bites and wanting to cry, my local guides Jimmy and Geovenny were rather more resourceful. They built a raft, in about ten minutes flat. 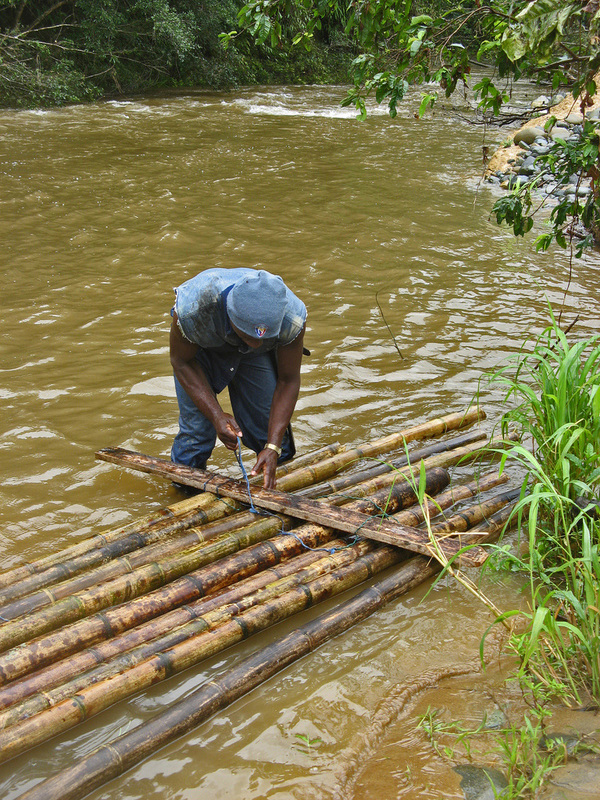 Two metre-long bamboo poles were lashed together with string and wrapped in plastic to keep them watertight. Geovenny braved the current to stand close to the opposite bank. First, our bags were pushed across – Jimmy let go of the raft and Geovenny caught it as it rushed back downriver. Then it was my turn to be the cargo. “Don’t move!” warned Jimmy as I sat on the plastic, but I was already rigid with terror. There was no mobile phone signal out here, no way to get help if this all went horribly wrong. He pushed me upstream… and let go. I sped back downriver and the front of the raft flew past Geovenny’s outstretched hand. He lunged further into the water and caught the back of the raft just before it was out of reach. I crumpled onto the muddy bank, shaking with fear and adrenaline and relief. I hope I never have to get across a frothing river on a handmade raft ever again. The boda-boda – the ubiquitous motorbike taxi – is the most efficient vehicle for travelling the traffic-rammed streets of Uganda’s capital, Kampala. It is also the one most likely to result in head injury, broken bones, or death. Boda-bodas avoid traffic jams in a number of creative ways, including driving on the ragged pavements; driving down the middle of the road; and driving on the wrong side of the road, into the oncoming traffic. Add to this the fact that few have headlights, no helmet is provided, Kampala’s roads are cratered with potholes, and the drivers are keen to drop you off as quickly as possible – and the danger becomes clear. 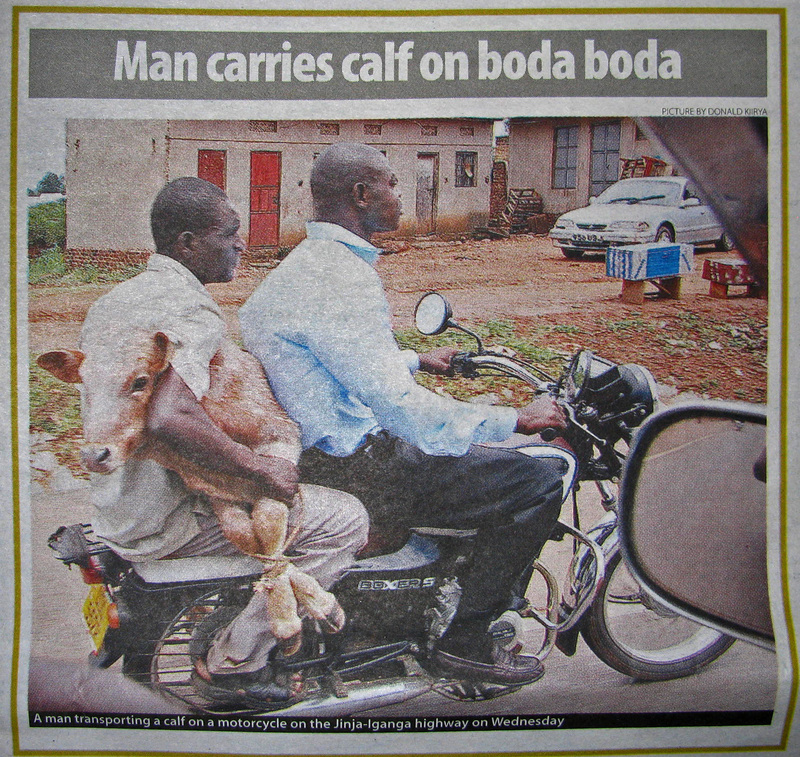 None of these threats stop entire families travelling by boca-boda, however – the father riding with a child on his knee, another child behind, and the mother riding sideways on the back with a baby in her arms. Left: La Nomadita gets to grips with her quad bike. Right: A very large-horned oryx. Not what you want to run in front of your vehicle. Four-wheeled vehicles are just not my thing, I’ve never mastered the art of driving. So when our 4×4 guide in the Namib desert warned us that “quad bikes always get their revenge”, I was worried. If you flip the bike, apparently, it will land on top of you. Given that we were rolling around in steep sand dunes, and I’d never handled one before, I was terrified that it would be me pinned under the bulky vehicle. But I cruised off into the African sunset, taking the slopes slowly, admiring the spectacular views, and picking up speed as I got more confident. My reward, far out into the desert, was a sundowner – bottomless G&Ts and sparking wine from a swiftly erected bar as the sun sank behind the dunes. About five seconds later, a full-grown oryx galloped in front of me. His striking black and white face was caught in the headlights, and his metre-long horns flickered past. I began to brake, but the oryx was already gone, and I was left to contemplate what would have happened if I hadn’t slowed seconds earlier. Mostly, however, I was fired up on gin, and excited about retelling the story of how I was almost impaled on an oryx horn while quad biking through the Namib Desert, drunk, at night. Tags: andes, danger, desert, ecuador, jungle, motorbike, namibia, quad bike, quito, rainforest, transport, uganda. Bookmark the permalink. Love it, totally hiliarious. Just wanted to share my Ecuadorian adventure witha fellow traveller. Hope you enjoy mine as much as I enjoyed yours.